Was he or wasn’t he…? The curious case of the Fraziers of Virginia. Reader Wendy Mathias has an intriguing ancestor who poses an interesting question. This particular character — and character he was!1 — was known at times as Leland Shiflett and at other times as Leland Frazier. Wendy knows his mother was Lucy Shiflett and that Lucy married John Frazier several years after Leland was born. The theory is that John Frazier was Leland’s father. One key clue is the fact that, in November of 1844, John Frazier executed a deed in Greene County, Virginia, for roughly 200 acres of land. The deed recited that it was “for and in consideration of the natural love and affection which he has and bears for … Leland Frazier, Lively Morris, Burton Shifflet, John H. Frazier, Michael Frazier, William Frazier, Shadrick Frazier, Susan Frazier and Mery W. Frazier and of one dollar of lawful money of this commonwealth.”2 Lively Morris and Burton Shiflett were sons-in-law. All of the Fraziers except Leland were legitimate. But putting aside the question of just how much mama was playin’ around here, the phrase — considered “antique” by 1916, as this Reading (Pa.) Eagle clipping shows3 — was very important … but by itself isn’t enough to answer the question. Let’s start with the whole notion of property. Then as now, land was the big ticket item in somebody’s life. Owning land made you wealthy. If you fell into debt, the first thing the creditors came after was your land. After all, you couldn’t run away with the land or use it up or spend it before your creditors could get their hands on it. And just as creditors wanted to get their hands on the debtor’s land, the debtor wanted to protect his land from his creditors. And then as now, protecting debtors wasn’t a big priority in the law. Protecting creditors was important, as was stopping people from doing foolish things with land, so the law made it hard to give land away. Oh, you could do it, but your creditors could come right along behind you and get the law courts to turn the land over to them. 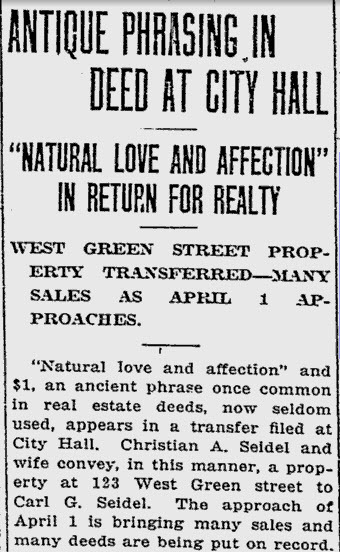 So why did deeds like the one by John Frazier list both natural love and affection and some token sum of money, like the one dollar here? Because where the deed had only good consideration, it was “considered as merely voluntary, and … frequently set aside in favour of creditors…”9 Putting in both a valuable consideration (some money) and a good consideration (natural love and affection) was simply hedging your bets. 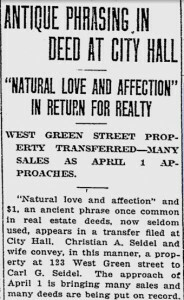 So what kind of “natural love and affection” was enough to make a deed valid? That’s a little murky. It’s defined as the kind of affection that “naturally subsists between near relatives, as a father and child, brother and sister, husband and wife.”10 A dictionary definition of a relative includes folks related by blood or affinity, and since that includes a relationship between a husband and a blood relative of the wife (and vice versa),11 that could include a stepson. So what have we got here? We have three things that support a conclusion that John thought Leland was his son. First, he used the name Frazier for Leland. No “also known as” reference. No use of the mother’s name. Second, John didn’t differentiate between Leland and the other legitimate children in any way. Those two in combination suggest the third point: John didn’t expect the other children to raise any objections to giving Leland an equal share. Had he not been acknowledged by John, then even the slightest falling out between Leland and any of the others could have ended up in court with everybody fighting over whether there really was “natural love and affection.” Unless John had a really warped sense of humor, he wouldn’t have set out to create a deed that could so easily end up in a legal dogfight. What unanswered questions do we have? First and foremost, what happened to this land? This was a bit of an oddball deed. It didn’t simply transfer the land in equal shares to the children. John also had a $55 debt, with one son and one son-in-law as security. He wrote the deed so that each of the kids had to pay a share of the debt before getting his share of the land. So… did Leland pay his share? Did he actually get any of this land? But remember: even if Leland got land without a fight, there’s still a chance that he got it only because the rest of his mother’s children loved him, whether he was the son of their father or not. And there’s a chance that every last one of them believed he was John’s son — whether he was or not. The language in the deed is evidence that John treated him as his son, but by itself can’t prove he was John’s son. You just hafta love guys like that. They make family history so much fun!